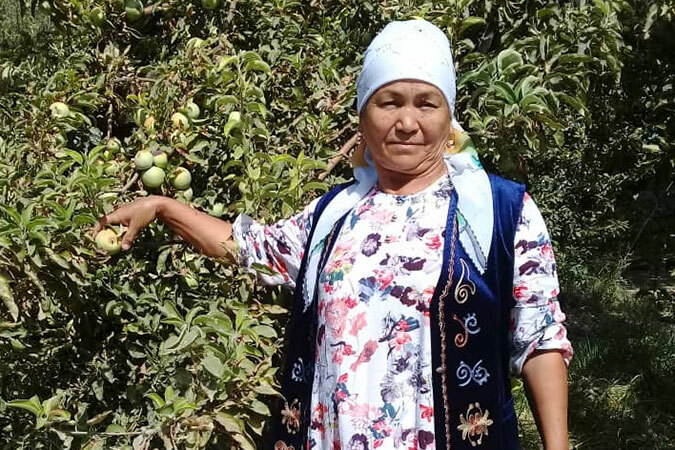 Bakirova Kyzdarkan is one of 124 women who have been elected to local water user councils across Kyrgystan, where water scarcity is threatening the livelihoods of many. She is mobilizing women in her community to advocate for equal access to water, and because of her work, several women now serve on local water management councils. "Even though Kyrgyzstan is well known for its natural resources, including water resources, most conflicts are happening because of unequal access to water. Most of the disputes between water users relate to the distribution of irrigation water, to which men and women do not have equal access. In comparison to men, women wait longer hours for water. In my case, I experienced a double burden as I had children to care for as well. I once left my grandsons at home while I stood in line all day for my turn at the Isfairam river. When I finally reached the front of the line, a conflict with a man broke out, and I left without water. But things have changed for the better since I learned how to get involved in water management issues. I began mobilizing other women in my community, training them on how to deliver messages about equal water access for women and men across the Uchkorgon community. I also helped women assess their eligibility for government water benefits. Through the group, women in my village have been empowered to raise their voices and resolve water disputes. Women have become more involved in local water management and their harvests have improved because of improved irrigation. Bakirova Kyzdarkan lives in Uch-Korgon, Kyrgystan, a multiethnic village populated by Kyrgyz, Tajik, and Uzbek. In early 2017, Kyzdarkan started actively participating in UN Women’s Livelihoods Through Participation and Equal Access to Water Project, funded by Government of Finland, and she has continued to advocate for gender equality in water management. Kyzdarkan recognizes the importance of including rural women in decision-making roles. Her work demonstrates the importance of ensuring availability and sustainable management of water and sanitation for all, Sustainable Development Goal (SDG) 6, and SDG 5, which promotes gender equality and calls for women’s leadership and participation in all aspects of life.